Bio Clean provides medical waste disposal throughout Mt Vernon WA, Olympia WA, Redmond, Seattle, Tacoma and Washington. They are a bio hazard remediation and waste disposal company and they have many years’ experience dealing with medical waste. Medical waste by its nature is a risky business. Medical waste contains infectious materials and can pose serious health risks if not dealt with properly. There are strict regulations in place that need to be followed and adhered to when it comes to medical waste disposal. It is the responsibility of a medical practices or facilities to ensure they comply with these regulations. Bio Clean can take care of your medical waste disposal. Whether you are a hospital, medical clinic, veterinary clinic or private practice, they can help. They take over the responsibility of your medical waste and they will ensure you are compliant. It does not matter if you are a large hospital or a small tattoo and piercing shop, Bio Clean can take care of your medical waste. An important part of medical waste is sharps disposal. Sharps include needles, scalpels, capillary tubes, dental wires and more. The items pose additional risk as they can easily cut or pierce skin. This increases the risk of infection. Sharps can be contaminated and contain viruses such as HIV, Hepatitis B and many others. Bio Clean crews are well trained and experienced, and they know how to deal with sharps and related items. They use puncture resistant containers as week as personal protective equipment when dealing with medical waste and the disposal of sharps. They label and document everything according to regulations and guidelines. 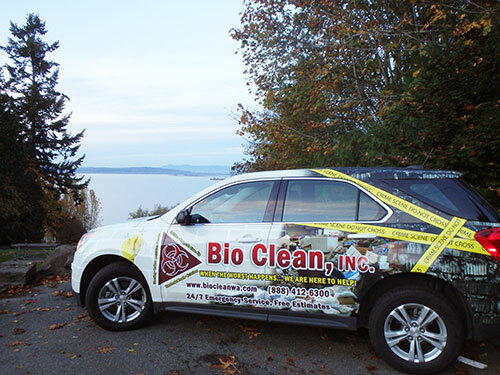 If you need professional medical waste disposal in Mt Vernon WA, Olympia WA, Redmond, Seattle, Tacoma or Washington, then you need look no further than Bio Clean. Traumatic emergencies or accidents are quite common and it is all the more obvious that they leave behind a lot of blood and other bodily fluids which can be harmful to the human body. Therefore, you need to sanitize the area properly and clean all the furniture or other equipment in that area in order to ensure your safety. So, you must immediately look for a trauma scene clean up service. We, at Bio Clean Inc., are an experienced and skillful disaster response team who have the right knowledge and expertise to carry out the cleaning up of accident, unattended death, suicide, bio hazardous wastes, and other such sites. We ensure that you and your property are safe from all kinds of bacterial germs and other such diseases. We are available at your service for 24×7. So, if you are from areas like Bellingham, Everett, Olympia WA, Seattle, Tacoma, or Washington, you can resort to us without any hesitation. If proper measures are not taken at a crime scene site or a traumatic accident site, it can lead to health concerns. Therefore, one needs to make sure that the growth and spread of diseases are brought under control by an emergency cleaning up service who can clean the area thoroughly, thereby eliminating chances of any issue right from the roots. Any regular cleaning in the house needs a mop and a bucket, or a vacuum cleaner at the maximum. But the cleaning up of blood, fluids, and other such things in an accident site is different. You need to know about proper disinfectants and chemicals which can effectively cleanup the area. Only a professional company has that sort of knowledge and expertise to successfully make an area cleaner, safer, and healthier again. So, now that you know the benefits of hiring an emergency cleanup service, you should quickly contact us now. The pain of losing someone you love especially in a tragic incident like suicide is too much to deal with. One cannot possibly have any consolation in such a scenario, and more often than not, there are situations where one suffers from mental trauma. Therefore, cleaning up such crime scenes become an additional responsibility which is difficult to take care of by the close ones of the deceased. That is why the role of an emergency cleanup service has become all the more important. We, at Bio Clean Inc., are one of the leading emergency cleanup services that can help you with all kinds of cleanups, starting with suicide cleanup, death scene, crime scene, or housing and commercial properties, or biohazard and medical waste cleaning, at any time of the day. Right from blood or fluid sanitation to the meth lab cleanup, we can restore any area back to normal life and help you live a cleaner and healthier life. So, if you are based in areas like Bellingham, Everett, Olympia WA, Seattle, Tacoma, or Washington, then you can rely on us. Here, we have put together 2 tips on choosing the right company for cleaning up suicide sites. Take a look. The people who commit suicide are not in the right mental state. Therefore, when they do the act, it can be any hour of the day. Or you might come to realize or notice the dead body at an odd hour. But you certainly cannot leave it unattended. So, you have to make sure that the cleaning services have professionals who can attend you 24×7. The next thing that you need to worry about is the proficiency of the team carrying out the task. You have to make sure that the people have the knowledge, resources, and equipment to implement the cleaning up process in a fruitful manner, eliminating all chances of bacterial growth and spreading of diseases. After considering all the factors, if you think that we can be the right choice for a suicide cleanup, then get in touch with us now.